V O L U M E 5 1 I S S U E 4 A U G U S T 2 0 1 8 27 building construction activity increases by $5.63 million. The U.S. economy is on pace to grow by over $600 billion in 2018, and that will expand the garage door industry by nearly $280 million (at installed value), since about .83% (i.e., just over eight-tenths of one percent) of every construction dollar is spent for garage doors. That does not include operators mounted apart from door installations, nor does it include related products such as dock and materials handling equipment. Like it or not, autonomous vehicles – self driving cars and trucks – are a future certainty, and their existence will have an impact on the type and quantity of garage doors sold. It is tempting to dismiss "driverless" as a phenomenon that will impact only selected high density locations, but the abundance of entrepreneurial, economic and technological opportunity inherent in the idea will bring it to fruition. A Morgan-Stanley study revealed that the average U.S. automobile sits idle 96.0% of the time! Moreover, when vehicles do move, they tend to do so all at once, thus there are 810 million parking spaces on U.S. soil – about 2.5 parking places per person or 3 per vehicle! Self-driving cars and trucks will reduce the demand for privately owned cars and thus the demand for garages and garage doors. The Global Economy Never think that the garage door industry - or any business enterprise - operates in "splendid isolation" from the rest of the world. For example, how much garage door industry success is the result of parts made in China, production in Mexico, German designs, Israeli software & Swedish capital? This is a very partial list of the industry's global interdependency, but it reflects the fact that all economic activity is an intertwining of resources, technologies and opportunities that generates a whole, far greater than the sum of its parts. Gross Domestic Product (GDP) is the most encompassing statistic for purposes of forecasting, and can be measured in numerous ways, most typically as the sum of all domestic expenditure and investment, plus the net of imports over exports (which has been a negative number for nearly 50 years). 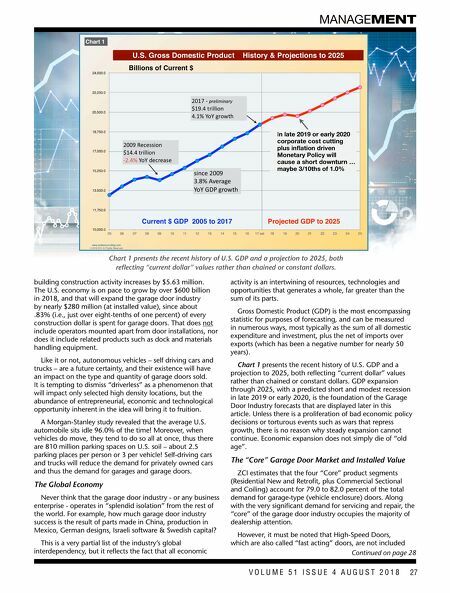 Chart 1 presents the recent history of U.S. GDP and a projection to 2025, both reflecting "current dollar" values rather than chained or constant dollars. GDP expansion through 2025, with a predicted short and modest recession in late 2019 or early 2020, is the foundation of the Garage Door Industry forecasts that are displayed later in this article. Unless there is a proliferation of bad economic policy decisions or torturous events such as wars that repress growth, there is no reason why steady expansion cannot continue. Economic expansion does not simply die of "old age". 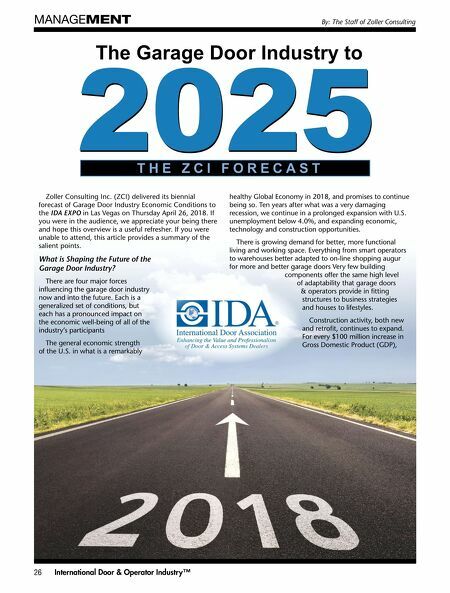 The "Core" Garage Door Market and Installed Value ZCI estimates that the four "Core" product segments (Residential New and Retrofit, plus Commercial Sectional and Coiling) account for 79.0 to 82.0 percent of the total demand for garage-type (vehicle enclosure) doors. Along with the very significant demand for servicing and repair, the "core" of the garage door industry occupies the majority of dealership attention. However, it must be noted that High-Speed Doors, which are also called "fast acting" doors, are not included www.zollerconsulting.com © 2018 ZCI. All Rights Reserved 10,000.0 11,750.0 13,500.0 15,250.0 17,000.0 18,750.0 20,500.0 22,250.0 24,000.0 05 06 07 08 09 10 11 12 13 14 15 16 17 est 18 19 20 21 22 23 24 25 Billions of Current $ U.S. Gross Domestic Product History & Projections to 2025 2009 Recession $14.4 trillion -2.4% YoY decrease since 2009 3.8% Average YoY GDP growth 2017 - preliminary $19.4 trillion 4.1% YoY growth Current $ GDP 2005 to 2017 Projected GDP to 2025 In late 2019 or early 2020 corporate cost cutting plus inflation driven Monetary Policy will cause a short downturn … maybe 3/10ths of 1.0% Chart 1 MANAGEMENT Continued on page 28 Chart 1 presents the recent history of U.S. GDP and a projection to 2025, both reflecting "current dollar" values rather than chained or constant dollars.